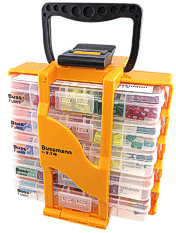 ATO/ATC fuses kit includes 180 pieces. 5 different sizes in a 7" x 3 3/4" plastic box. Maxi fuse kit includes 25 pieces. 5 different sizes in a 7" x 3 3/4" plastic box. Mini-ATM fuse kit includes 80 pieces. 7 different sizes in a 7" x 3 3/4" plastic box. Mini LP fuse kit includes 50 fuses. 10 different sizes in a 7" x 3 3/4" plastic box. Fuse link kit includes 24 pieces total. 13 different sizes in a 11" x 6 3/4" x 1 3/4" plastic box. 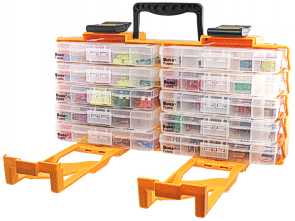 Space-saving micro-fuse link kit includes 136 pieces total. 16 different sizes and a fuse puller in a plastic box. These automotive fuse kits come with a caddy that easily allows you to access all of the most common fuses you may need in one single carrier. The caddies have secure latches and clear trays for easy identification. FUSE KIT 5 includes the five trays in the first column. FUSE KIT 10 includes all 10 trays in both columns. 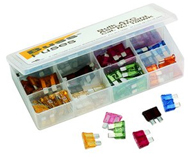 Glass fuse kit includes 180 pieces. 13 different sizes in a plastic box.